Home News Which Countries Have Impact on Felt Market? Archeologists discovered evidence about felt-making on wall paintings before the Christ. Ancient men quickly found fabric´s great properties and used it for making warm clothes, saddles, and strong tents. One of the oldest evidence of felt manufacture and usage was found in Siberia (today’s part of the North Asia) in the frozen tombs of nomadic horsemen. Greek and Roman soldiers protected themselves by felt socks, tunics and boots. Felt’s popularity spread to the northern countries of Scandinavia as well. Today’s industrial felt is produced and exported on a global scale. Germany leads production and exports in Europe, while significant felt suppliers can be found in Asia and the United States of America. Germany is leading producer and net exporter of wool felt. Its exports amounted to 20,8 mil. EUR in 2013, three times more exports than Italy, the second largest exporter. Exporting power of Germany has stabilized in a four year period, evident on its share of exports: 37,3% in 2009, 31,2% in 2010, 30,9% in 2011, 31,3% in 2012, and 31,7% in 2013. Based on the data from Trade map of The International Trade Center (ITC), China exported 1,182 tons of felt last year – the largest quantity of all states. Given its position on a global trade it is not surprising as China is the largest exporter and the second largest importer in the World. Germany was second largest exporter of industrial felt with 1,128 tons. The United States of America (USA) increased the export volume by more than 120% (507 tons) in 2013 in comparison to 2012 (226 tons). Exports of other felt producers remained below 500 ton level in 2013, including India, Mexico and Spain. Exports of the USA in 2013 equaled to 3,2 mil. EUR, recording a continual growth for past four years. 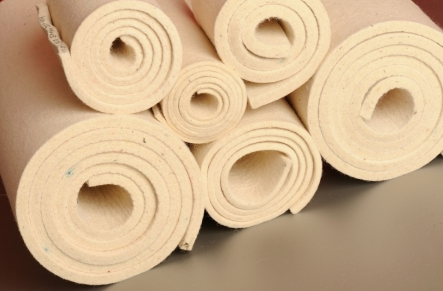 India continues to increase its felt output and its market share as it is the fourth largest felt exporter. Its share of global profits was 6,2% in 2013 and has continued to increase in past ten years. As already mentioned, other countries such as Mexico, Japan, Italy and Spain are important felt exporters as well, however they are smaller compared to China and Germany. As evident from the historical data, leading states continue to be the same nations and their positions has not changed very much.